4Videosoft HD Converter for Mac is able to convert popular videos like AVI, FLV, MP4, MKV, MXF, WMV and more to HD MPEG-4, HD MPEG-4 TS Video, HD H.264 and HD MOV Video and so on. You can optimize the output video with versatile editing functions like trim, effect, crop and watermark and so on. 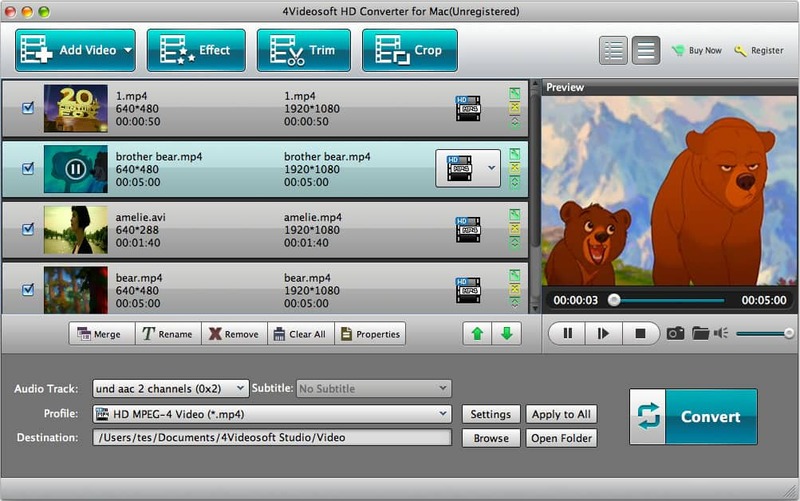 4Videosoft HD Converter for Mac can convert popular videos like AVI, FLV, MP4, M4V, MKV, WMV, TOD, etc. to HD videos. You are able to have a HD enjoyment freely with this powerful HD Converter for Mac. The output videos are compatible with your Samsung Galaxy Note 5, Samsung Galaxy S6, HTC one, iPhone 7/6s Plus/6/6 Plus, iPhone 5S/5C, iPod touch, iPad air, etc. 4Videosoft HD Converter for Mac provides you with powerful editing functions to optimize your video freely. For example, you are able to modify the video effect by adjusting the video brightness, contrast, saturation, hue and volume. You are allowed to reset the video length and screen size with this powerful HD Converter for Mac. It enables you to add your favorite text and watermark for your output video. The wonderful HD Converter for Mac allows you to preview the original video and capture pictures of your favorite video moment. If there are some audio tracks and subtitles in the source video, you can choose your favorite one.